Ultimate Celtic Collection – (Tesco) Crimson, UK. The Christmas Wish – Avalon Music Ltd.
For 19 years, Pamela Morgan was lead singer, guitarist, and arranger for Canada’s pioneering “Celtic” band, Newfoundland’s Figgy Duff, who brought the traditional music of Newfoundland to the world stage. Since then, Pamela has been spearheading her own independent record label, Amber Music, producing music for NL's finest roots artists, including four of her own solo CDs, and licensing tracks to various labels worldwide. As solo artist she has graced stages in England, Canada, the US and Europe, and overseen productions of two original scores for live theater; her own folk opera, “The Nobleman's Wedding”, and Figgy Duff's score for Shakespeare's "The Tempest". In 2007 she received an honorary doctorate from Memorial University, and in 2008 embarked upon a different journey, studying Graphic Design at the College of the North Atlantic. This new skill set led to the release of her handmade book "Newfoundland Ballads for Piano and Voice" in 2011. In 2013 Pamela completed recording Figgy Duff's Tempest score, "Sounds and Sweet Airs" and released her fourth solo CD, entitled "Play On". Further development work of her original folk opera " The Nobleman's Wedding" is ongoing, inspired by a 2014 production of the opera at the Stephenville Theatre Festival. She continues to write, arrange, perform and tour in her own highly original and hauntingly beautiful style. "...a voice that lifts you up and lays you down on a bed of thoughts and dreams"
Pamela and the other core Figgy Duff member, founder Noel Dinn, led the band through the production of six albums, several videos and countless tours throughout North America and Europe; taking Figgy Duff from local innovators to a powerful international presence in the burgeoning worldwide folk/Celtic scene. Before Noel Dinn's untimely death in 1993, he worked with Pamela to produce the exquisite "The Colour of Amber" (also featuring Anita Best). With "Colour...", Pamela continued her musical journey, redefining some of the most beautiful and haunting traditional material that ultimately landed the album on several "Year's Best" lists throughout the world. Also with Anita Best, and Genevieve Lehr, Morgan transcribed over 100 folk melodies for a book of NL folk songs published by University of Toronto Press, "Come and I will Sing You." In the early nineties, Pamela gathered back all of her former recordings, including the complete works of Figgy Duff, and organized them under her own record label, Amber Music. With this impressive body of work, as well as releases from Anita Best, the late Emile Benoit, and her own solo work, Pamela is using Amber Music to shape and direct her continuing musical journey, bringing the past together with the present and passing it on to her ever growing worldwide audience. 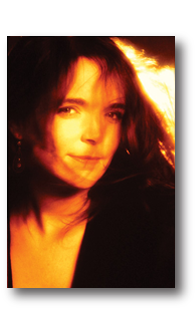 With the release of her first solo album, "On A Wing And A Prayer"(1995), Pamela carried on the tradition of Figgy Duff in her own equally innovative way with tales of romance, longing, a wounded heart, and various jewels of traditional Newfoundland/Celtic culture. Many of these songs found their way onto compilations throughout North America and Europe, and the album was released in Japan and Taiwan. Seven years later, in 2002, came "Seven Years" featuring her developing songwriting and piano skills. Described as a "fascinating life study" by Billboard magazine, this is entrancing music, often inspired by nature and the ocean, a product of a unique time and place. In 2005, Pamela returned to her roots with an all-acoustic, all traditional album entitled "Ancestral Songs", recorded in England, and featuring Chris Leslie (Fairport Convention) on violin. As a solo artist, Pamela has toured extensively over the years, throughout North America, the UK and Europe, as well as representing Canada at EXPO in Japan. She has been also been recognized for her production skills, producing albums for other artists, and both the tour and live recording which marks Figgy Duff's silver anniversary. She has written extensively for film and theatre, and in 2006, oversaw the production of Figgy Duff's original score for Shakespeare's "Tempest", and her own original Folk Opera, "The Nobleman's Wedding", which went on to tour the Arts Centers in Newfoundland. In 2007 Pamela was awarded an honorary doctorate of letters from Memorial University, in recognition of her vital contribution to the traditional music of Newfoundland and Labrador. In 2008, Pamela began a two year course in Graphic Design at the College of the North Atlantic, which she completed with honours in 2010. This has led to new loves- photography, print, web design; and a renewed respect for the teaching profession. It also gave her the skills required to design and notate her beautiful book of piano arrangements of Newfoundland folk songs- "Ballads for Piano and Voice", released in 2011. 2013 finds Pamela with a new full length recording; an album of mostly original material called "Play On". Recorded mostly in England with English session musicians, the album features traditional and original material, and (a first for Morgan) one cover song. Innovative, beautiful, powerful, and highly original, Pamela Morgan continues to set the standard of integrity, perseverance, and artistic vision for artists of all disciplines and musical genres.